Dust bunnies usually are swept under the rug or found lurking under beds, but what do dust bunnies do all day? The Dust Bunny Mafia Comic explores the inner workings of and events relating to the lives of several lovable but dangerous dust bunnies. The Dust Bunny Mafia was formed directly after Leo worked his way to the top of the family. Once he earned the title, his allies got their restitution as esteemed members in his mafia family. Meet the whole gang over on the cast page. Bret Juliano is a cartoonist and illustrator. He is the creator of the all ages Dust Bunny Mafia comic, which updates twice a week and began running in 2011, and Mobimals. 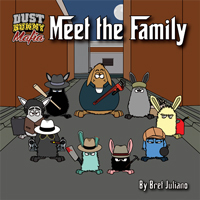 In late 2016, Bret published Meet the Family, a Dust Bunny Mafia comic collection. His dust bunny mobsters have been included in several anthologies including Unlawful Good and Forgotten Histories. 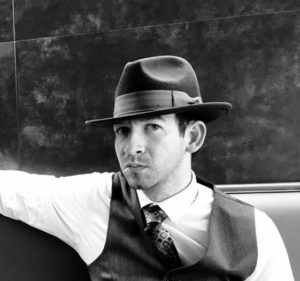 He is an avid consumer of mafia trivia, both fact and fiction, and a passionate collector of fedoras.